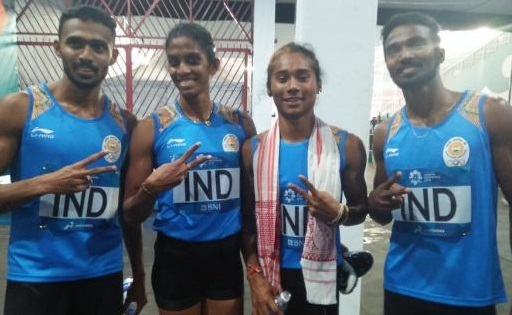 Sprinter Hima Das and Co have been able to win a silver for India in the mixed 4×400 m relay final on Tuesday evening at the Asian Games 2018 in Jakarta of Indonesia. Machettira (28 years) and Arokia Rajiv. The gold in the event was won by the Bahrain team while the Kazakhstan team won the bronze medal. While Bahrain finished at 3:11.89 seconds, India finished at 3:15.71 seconds and Kazakhstan finished at 3:19.52 seconds. It may be mentioned that in the women’s 200 m semifinal in the evening on Tuesday, Hima Das was disqualified for false start. However, India’s Dutee Chand entered the final in the same event clocking 23.00 seconds. Hima Das qualified for semifinal in women’s 200 m race in the morning on Tuesday finishing fourth in her heat. At her heat, Hima finished with a timing of 23.47 seconds. Earlier on Sunday, the star sprinter from Assam won silver the women’s 400 m race of Asian Games 2018 by finishing at 50.79 seconds breaking her all-time personal and national record. The gold was won by Bahrain’s Salwa Eid Naser who finished at 50.09 seconds. Eighteen-year-old Hima Das is the second athlete after Bhogeswar Baruah to have won a medal in Asian Games. Bhogeswar Baruah, an Arjuna Award winner, is an 800 m gold medallist in the 1966 Asian Games. Hima Das, who hails from Dhing in Assam’s Nagaon district, scripted history by becoming the first ever Indian woman to win gold at the IAAF World Under-20 Athletics Championships held at Tampere in Finland. Hima Das’ timing of 51.32 seconds at the Commonwealth Games placed her sixth in a world-class field but a run in 51.46 seconds at Tampere made her the first Indian woman to win a gold at an IAAF World Junior Championships. The 18-year old sprinter, after finishing sixth in the Commonwealth Games 400 m final in Gold Coast in April, has gone onto improving her timings. She lowered the Indian U-20 record in 400 m to 51.13 seconds while winning gold in the recent National Inter State Championships in Guwahati.